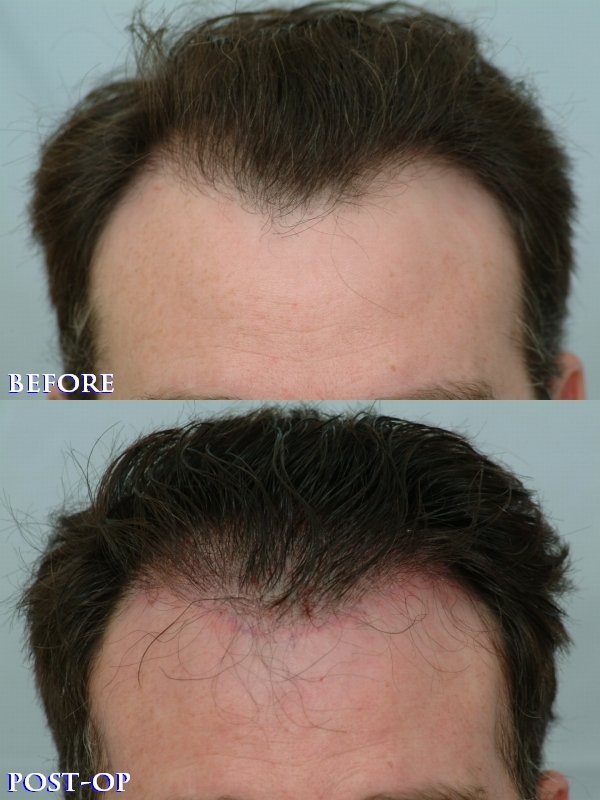 Here is a class 3 patient who recently underwent a small session of CIT in hopes of merely thickening the hair line. The treatment plan was to transfer 700 CIT (non-strip) grafts to reinforce the frontal hair line, and fill in the temporal peaks. This mature individual wisely chose to simply restore the lost density without lowering the hairline. At age 50, the patient’s new growth adds subtle, yet noticeable improvement. On the other hand, there are many younger patients who typically desire to lower the frontal hairline and restore the front with more aggressive density. Often times, we emphasis, to our younger patients, that more density can be achieved at a later date because they will more than likely be satisfied with the first session or come in for a later “touch-up”. The photos attached below depict the new growth that was seen just a few months after the procedure. Typically, scalp donor hair can become visible about three months to 8 months after the procedure. The result shown here, is now fully matured and also appropriately complements this middle-aged patient’s facial characteristics. 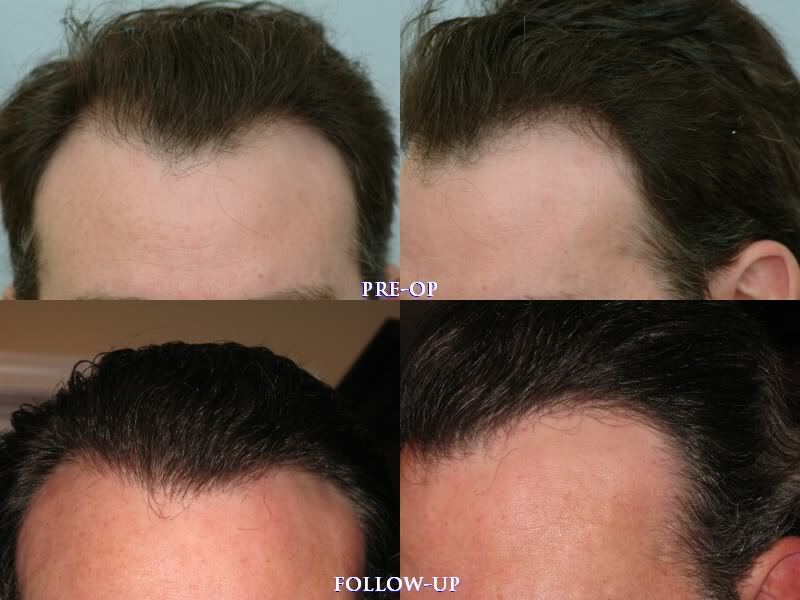 The soft appearance of the hair line allows the patient’s procedure to go undetectable in the public eye. CIT is a non-strip surgical procedure that entails between 0 to 2 percent transection (minimal trauma to follicles), 2.9 hairs per graft (effective harvesting), and produces consistently natural looking results. More hair per graft can exponentially benefit any patient because it lowers the consumption of donor area resource while giving patients more coverage value per graft for their hard earned money. Generally speaking, non-strip methods of hair restoration procedures are commonly associated with much less noticeable scarring and minimal visual evidence from the procedure, although there are no guarantees that no scarring will occur after hair restoration surgery. Along with providing excellent results, our first priority is to ensure that patients are suitable candidates for hair restoration surgery and that each understands the definition of progressive hair loss. We are pleased to present one more patient who has reached their goal and is satisfied with the natural looking results. We give our best efforts to produce results in the donor area (back of head) as well as the recipient area (top of scalp). I can accept this one, personally I wouldn’t do anything, if I were him I would just buzz down all over which I think can buy him another 3-4 years before he needs a hair transplant. That said, I think 700 is no big harm if this is going to make him feel that much better about himself. The after pics are too deceptively dark in relation to the before pics. » this is going to make him feel that much better about himself. This is what I would do too, when I am ready, I would do no more than 500 grafts just to test the water. Hmm… No spotting this one as a HT. Here is a Smart class 3 patient that looks good. Fine work does not go unnoticed. How many grafts do most patients do on the actual hairline itself? Aggressive hairline design is so over rated. Dr. Cole does some fine work. » Dr. Cole does some fine work. I think so far just based on my observation Dr Cole has the most efficient use of grafts. Very nice results. Just wish he was a little cheaper. I think the results are fairly good considering the input,but as earlier said dark images alone serve little purpose unless accompanied by pics in light -natural and/or artificial. looks good for 700 grafts although the difference looks very minor i guess if the guy is happy then thats all that counts. personally i woulda kept my money for such a small procedure unless it was to help conceal an actual bald spot. his hairline looks the same for the most part.